Brahmas arrived in the UK around 1840-1850. Originating from India, particularly the region known as Brahmaputra, hence their name. The first birds to be exported from India went to USA with their offspring being introduced to Britain. Some of these were then presented to Queen Victoria. 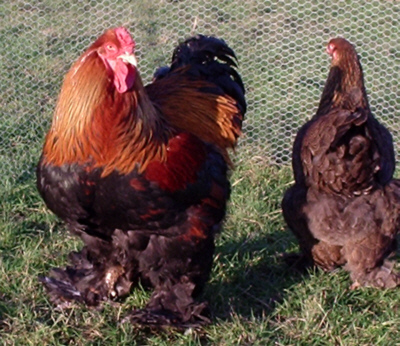 The Brahma was included in the first book of poultry standards, published in 1865. The massive size and strength of the Brahma suggests that the breed has a close relationship with the elusive Asiatic jungle bird referred to as Gallus Gigantus. The early imports to USA record Male birds attaining weights of 6.38 Kgs (14lbs), which exceeds most of today's specimens. The modern Brahma being amongst the largest of the breeds. In 1865 and for the next 100 years the breed was recognised in only two colours, Lights and Darks. 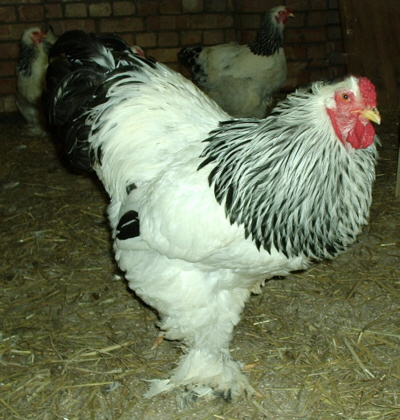 Both with profuse plumage, the basic colour of Light Brahma is white with black and white hackle feathers. The main tail feathers are black with white side hangers, which gives the body a much wider appearance. In Dark Brahmas the colour is a silver version of the red/black partridge pattern with the under-body, main tail and foot feathering being black. The back is silver/white and the hackle is black and silver. Earlier cross breeding with the dark Grey Chittagong birds is probably responsible for the Dark version. Today, Brahmas are available in a wider range of colours including Gold, Black, White, Blue, Buff Columbian, and Blue Columbian. The most popular variety is the 'Gold' or golden partridge or black/red. Brahmas are also available in miniature versions with the above colourings. The Brahma was well known for its laying capabilities but breeding to develop modern colour patterns have diminished its economic qualities. The skin colour is yellow and the eggs are brown. The Large Fowl can take up to two years to become fully developed which means that the Brahma is sometimes disregarded as a commercial chicken. As you can see from the weights they are pretty hefty birds. They are commonly thought of as Gentle Giants and are particularly popular because of their massive size and gentle nature. They have feathered feet and this gives them an almost 'Yeti' appearance as they thunder along. Surprisingly, despite their size the eggs they lay are really no larger than from most other large fowl. They are great favourites with children and adults alike because they are so easy to tame, and will readily follow you around. If they are kept in a multi free-range environment, you have to keep watchful that the other cockerels don't bully the Brahmas, as despite their size they seem to be the more submissive birds.